With the kids home on Spring Break, it has added to a whole other dimension of crazy around here. This is on top of the already extreme schedule we are keeping. With everything we are currently doing in the vineyard and the wine aspect of our lives, cooking, except for very quick, simple meals has taken a backseat. My oldest son is a shrimp lover and begged me for something for lunch that included it. I always keep a bag of frozen shrimp in the freezer so this was easy enough to throw together. It had a good flavor and was gobbled up quickly. I guess it beats peanut butter and jelly any day. I didn’t really take any pictures making it, you won’t need them, it’s very easy to make. In a saucepan, bring 2-1/3 cups water, 2/3 cup coconut milk and 1-1/2 teaspoons salt to a boil over high heat. Stir in the rice, cover, lower the heat and simmer until the rice is tender and most of the liquid is absorbed, 15 to 20 minutes. Meanwhile, in a medium skillet, heat the remaining coconut milk over medium heat. Whisk in the curry paste. Stir in the green beans and cook for 3 minutes. Add the peas and shrimp and cook, stirring, until the shrimp is cooked through, 2 to 3 minutes; stir in the lime juice and season to taste with salt and pepper. Serve over the coconut rice. Meanwhile, in a medium skillet, heat the remaining coconut milk over medium heat. Whisk in the curry paste. Stir in the green beans and cook for 3 minutes. Add the peas and shrimp and cook, stirring, until the shrimp is cooked through, 2 to 3 minutes; stir in the lime juice and season to taste with salt and pepper. Serve over the coconut rice. I’m such a coconut freak. I love the idea of cooking rice in coconut milk. Thanks for the inspiration. That looks like a perfect lunch or dinner. I can just smell the coconut and curry. YUM! That sounds like the perfect little meal! Beautiful and yummy, I love coconut. I love coconut flavored anything. I always have rice in my rice cooker. Can this be done in my rice cooker? I like the shrimp but am not a fan of peas. Can I leave it out? and if there are any leftovers (chances are NO) that rice will make fabulous fried rice. i am drinking a lot of coconut water these days because of killer workouts–what a diff they make in replenishing you. You are the best mom ever, you know that right? Your son requests something with shrimp for lunch and you have it on hand? You are beyond awesome. I love cooking with coconut milk, adds so much to a dish. Delicious! I want this right now. Send some my way. Oh, well guess I will have to make it. Thanks. Oh yum, the perfect quick meal, which is all I have time for too! Thanks for always helping with dinner! I agree with Roz Zabel, I think I will make this without the peas~looks so good! I am a huge shrimp fan! This looks delicious. Now I am making this for lunch!! What a beautiful dish! And why am I thinking about Forrest Gump??? 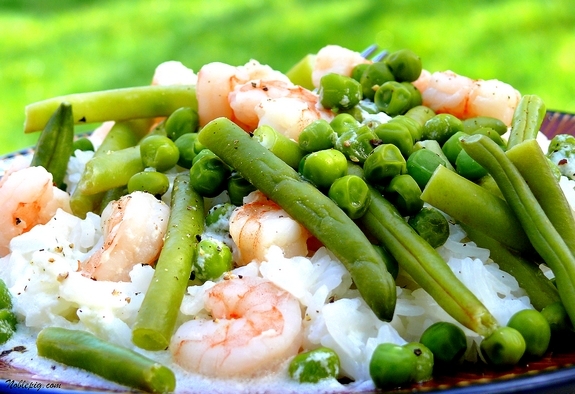 Shrimp and coconut just bring that Caribbean vibe to cooking…I can feel the tropical brereze. What a simple and fantastic dish…I love every ingredient. What a perfect dish for spring. The flavors are bounching off my tongue as I type. This looks delicious, Cathy. You’ve given us the perfect quick meal. I love the bright colors of this dish! Sounds yummy! Coconut rice sounds great! I love shrimp, but at $9 per pound, I only serve it about twice a year (sad). Cathy my dear, I don’t think it matters what you post on your blog, it will always look phenomenal. I do not eat shrimp unless it is deep fried, but you make it look good enough for even ME to eat! Your son has great taste! This looks light and lovely for spring, and I’m a shrimp fan too. I’ve never had coconut rice, but that sounds wonderful all by itself. 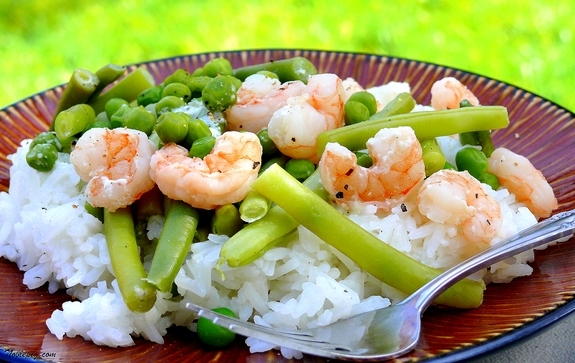 I love shrimp and coconut rice- will definitely try this. Beautiful pics! Oh how I love coconut rice! This is such a lovely dish! That is so “spring-y” looking. I have never had coconut rice, sounds good. Never having used coconut milk or cream to cook with, this will be a first for me. I just can’t get over how gorgeous and full of spring color this looks! Very nice! Love the coconut milk here, great flavor for the rice! I tried coconut rice for the first time on super bowl Sunday. Love it! Our hosts served it with chicken breasts marinated in a lime sauce and garnished with a mango salsa. It was incredible! Can’t wait to try your recipe Cathy! My husband loves shrimp! Might I suggest, a splash of fish sauce for some more depth. Looks very good and quick. Thank you. Hubby & I are not curry lovers so no curry. What could I substitute in place of curry? If I just leave the curry out wouldn’t it be too sweet? I used a 1/2 teaspoon of cayenne pepper cuz I too do not like curry. I think you’ll be fine, this does not taste like curry. Fantastic! I can taste it right now. 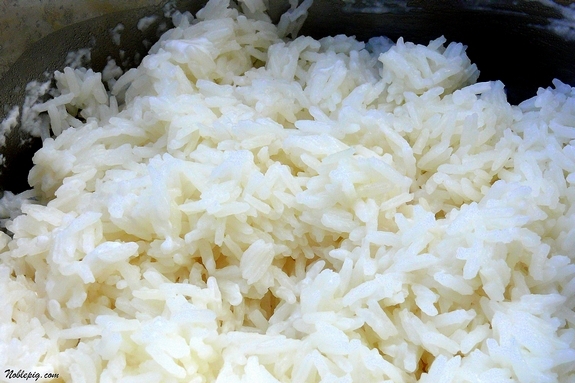 Coconut rice is an amazing revelation of flavors.